We want you to enjoy your international travel and thought we would share the following tips that can help you be prepared should the unexpected arise. Provide a copy of your Itinerary to your close family or friends. Include dates, locations, flight information, hotel name and phone number, cruise ship or tour company contact information, and any other pertinent information. Call your credit card companies one week in advance of departure to tell them the dates and location of your travel so you will avoid unnecessary “holds” being placed on charges. Bring with you and keep in a safe place a copy of your personal “Notification” document which contains key information in the event of the theft of wallet or passport (such as: passport number & date, credit card numbers & emergency phone numbers, etc.). Leave a copy of this document behind with a trusted family member or friend whom you can call in case the need arises. Some people make copies of both sides of each license, credit cards, etc. from their wallet. This helps them know what they had in their wallet and all of the account numbers and phone numbers to call and cancel if necessary. If you choose to do this, be sure to keep the photocopy in a safe place. Also, if your purse or wallet is stolen we’ve been told you should cancel your credit cards immediately...however the key is having the toll free numbers and your card numbers handy so you know whom to call and what to tell them. 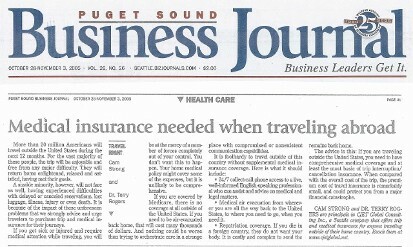 Make a copy of your travel insurance policy and take it with you on your trip. Be sure to keep the Emergency Assistance Company phone number with you at all times. In the event you have a medical or legal emergency, you will be able to quickly call this phone number collect for assistance. Make a photocopy of the first two pages of your passport and airline ticket (or e-ticket confirmation). Keep this in a separate location as this will speed replacement if lost. Put your name & address on a label inside your suitcases to aid identification if your luggage is lost. Bring along the appropriate voltage & outlet adapters if traveling overseas. If your wallet or passport is lost or stolen, immediately file a police report in the jurisdiction where your credit cards, passport, etc., was lost/stolen. This proves to credit providers you were diligent, and this is a first step toward an investigation (if there ever is one). Most important of all call the 3 national credit reporting organizations immediately to place a fraud alert on your name and Social Security number. A person with your wallet has the ability to make an application for credit over the Internet in your name. The alert means any company that checks your credit knows your information was stolen, and they have to contact you by phone to authorize new credit. ·	Put a hold/stop on your newspaper and mail or have someone pick it up for you every day. If you are able to have your “photo” printed on your credit cards, you will reduce the chance of someone else using your credit card if lost. We hope you have a wonderful trip and will consider CJET Global Consulting Inc. for your international travel insurance the next time you travel internationally. We also hope you will consider referring us to your family and friends for their travel insurance needs also. Be sure to read the U.S. Department of State’s Travel website http://travel.state.gov/ to find information on travel warnings as well as information on passports and visas. Please feel free to give us a call when you or your friends have questions or need assistance with your international travel insurance needs.